Kodak is about to release six new digital cameras in the coming months. Four of the new models are debuting in the new EasyShare M-Series. The Kodak EasyShare M753 and Kodak EasyShare M853 are both 3x optical zoom models with 7 and 8 megapixels respectively. Both will be available in August, with the M753 costing £100. The Kodak EasyShare M873 and Kodak EasyShare M883 meanwhile both have 8-megapixel CCDs, a 3-inch LCD and all-metal construction. The M883 also features face detection capabilities. These models will go on sale in August and September respectively. No pricing details have been announced. 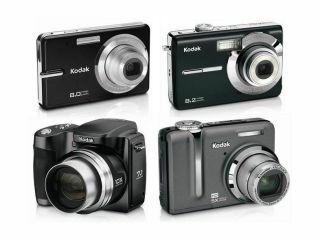 Kodak also announced the Kodak EasyShare Z1275 : a 12-megapixel snapper with 5x optical zoom, 2.5-inch LCD screen, and 'photographically-advanced features'. It's able to record 1280 x 720 video in MPEG-4 format. The 7-megapixel Kodak EasyShare ZD710 superzoom with high ISO settings and 10x optical zoom lens was also announced. Both will hit the shops in August; prices yet to be confirmed.